One of my first days in Spartanburg, a fellow Grand Opening Trainer shared with us that Spartanburg is number four on the list of "worst cities to be in the southeast." My mom told me last Sunday, "you guys need to be super careful. That's not a great area." We should've taken heed. We so should have! Last week, when setting up the restaurant, my friends left their belongings on a table. Two guys came in to get an application, and one of them helped himself to my friend Cassie's wallet. The worst part about this was that she had flown and had to contact her home state's DMV to get some sort of ID in order to fly home! Long, boring story short-they tracked the guy down, tazed him, and put him in jail. Bad news was, her wallet wasn't recovered. Yes. 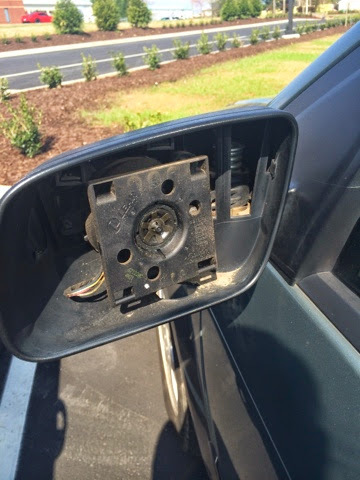 In case you were wondering, that's where's side view mirror should be. No, it's no longer there. Honestly, I have no words for this! All I know is that this small town girl who forgets to lock her car (and sometimes her house) is so not ready for the crime of the big city of Spartanburg. Watch your wallets...and your car parts! It's shady over there.